Sheila Pree Bright is a fine-art photographer nationally known for her photographic series Young Americans, Plastic Bodies, and Suburbia. She received national attention shortly after earning her M.F.A. in Photography from Georgia State University, and is described in the art world as a cultural anthropologist portraying large-scale works that combine a wide-range of contemporary culture. In recent years Bright has documented responses to police shooting in Atlanta, Ferguson, Baltimore and Washington DC. She observed young social activists taking a stand against the same struggles their parents and grandparents endured during the era of Jim Crow. In 2013 while photographing under-recognized living leaders of the Civil Rights movement, she made a connection between today’s times and the climate of the 1960’s that inspired her #1960Now project. 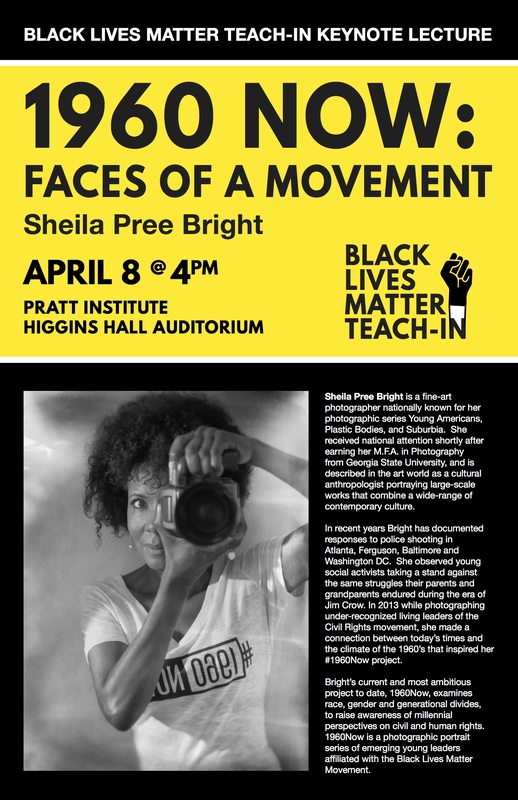 Bright’s current and most ambitious project to date, 1960Now, examines race, gender and generational divides, to raise awareness of millennial perspectives on civil and human rights. 1960Now is a photographic portrait series of emerging young leaders affiliated with the Black Lives Matter Movement. Bright incorporates an Instagram campaign into #1960Now, within which she asks people in the streets what they will do to bring about change. Bright’s work is included in the book and exhibition Posing Beauty in African American Culture (Deborah Willis, W. W. Norton, 2009). Bright’s photographs appeared in the 2014 feature-length documentary Through the Lens Darkly: Black Photographers and the Emergence of a People (Director: Thomas Allen Harris). Venues that featured her work include the High Museum of Art, Atlanta; Smithsonian Anacostia Museum, Washington, DC; The Museum of Contemporary Art, Cleveland; FotoFest, Houston; and the Leica Gallery in New York. She is the recipient of several awards including the Santa Fe Prize (2006), and her work is included in numerous private and public collection.